The infa exhibition has become a Hannover institution. Launched in 1954 as the "Lower Saxony Home Economics State Exhibition", the event was put on in the Stadthalle convention center and featured 300 exhibitors on 4,000 square meters of space. The exhibition was primarily directed at housewives. The original targets were greatly exceeded, as some 62,000 visitors thronged to the event, forcing security personnel to hold up "Temporarily Closed" signs at the entrance gates. 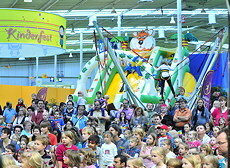 Over the coming years infa was to develop into one of Germany’s most popular consumer exhibitions. Organized by the German Housewives Association and Fachausstellungen Heckmann, the show became known to a wide audience beyond the confines of northern Germany. For many years the trademark of infa was a lady holding a lorgnette, symbolizing the discriminating housewife on posters advertising the event. As visitor and exhibitor numbers continued to go up, it was time for infa to move in 1974. With parking for over 50,000 vehicles, lots of exhibition halls and excellent transportation connections, the Hannover exhibition center offered the ideal prerequisites. While the main goal of visitors 50 years ago was to shop for a particular item, visitors became increasingly focused on obtaining information and experiencing an entertaining outing. 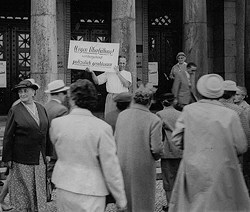 While husbands were admitted for half price as a reward for accompanying their wives to the show back in 1954, men have by now become a fixture among the tradeshow audience. Topics like construction and home equipment and furnishings have become increasingly "male" topics over the years, and infa has long since developed into an event for the entire family. With public attendance of 220,000 and participation by 1,300 exhibitors from across the globe, infa has become one of Germany’s biggest information and sales exhibitions. To ensure the show’s continued success. the organizers continue to weave the latest trends and topics into the program. The "Lebensart" special display represents a successful concept which has lent infa a new luster. And the "bewusst leben" and "bauen" special displays also reflect the spirit of the times for lifestyle and building tastes.